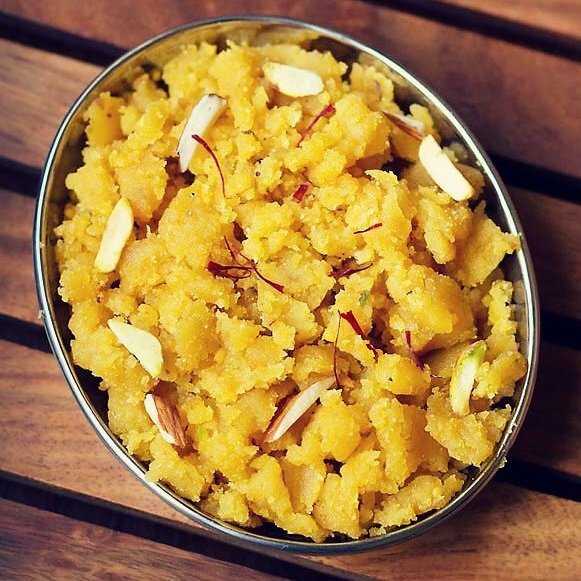 besan halwa recipe - a delicious halwa made from gram flour, ghee, sugar and cardamom powder. 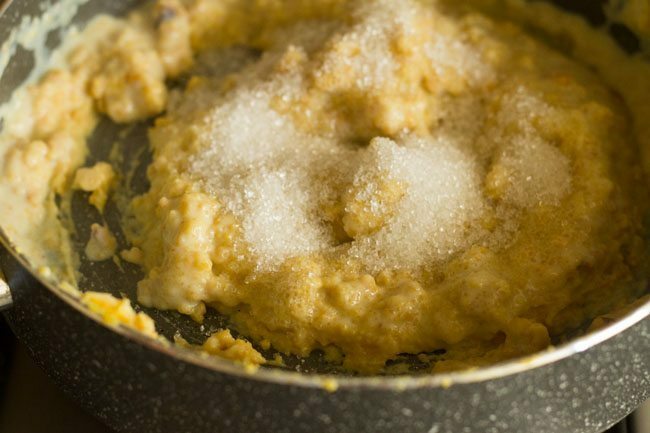 besan ka halwa recipe with step by step photos. 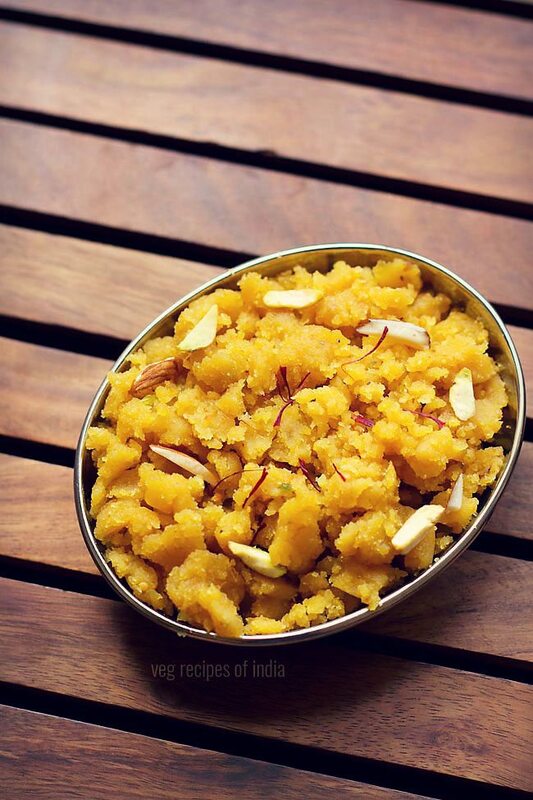 delicious besan halwa made from gram flour, ghee, sugar and cardamom powder. i thought of sharing a quick dessert for ganesh festival on the last day of ganesh chaturthi. 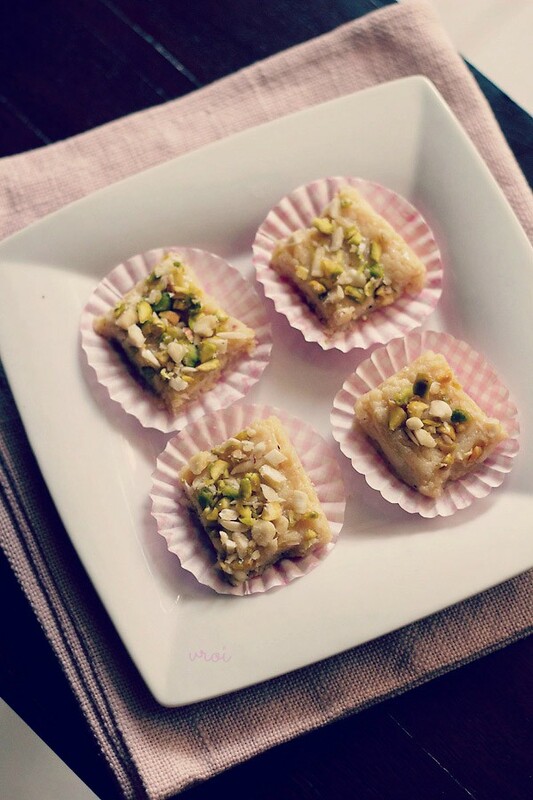 i had made besan halwa a few days ago, so took pics and sharing the recipe now. 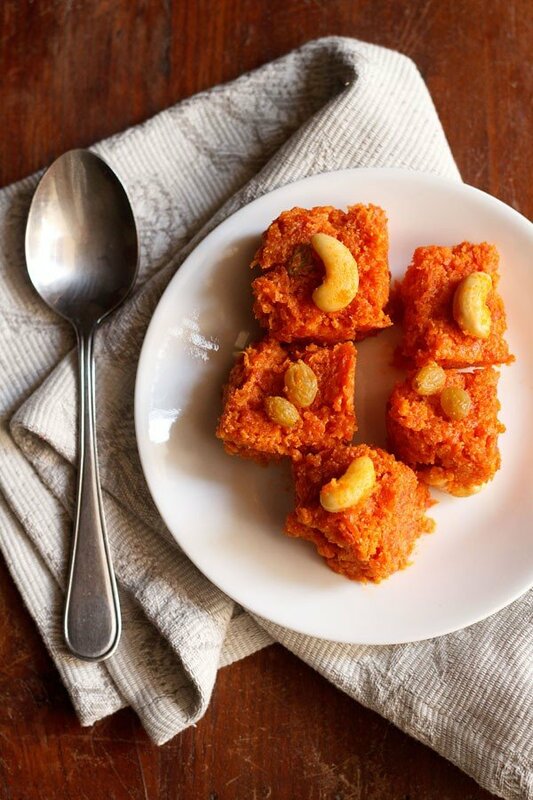 in fact you can make besan halwa on any festive occasion. you can offer it to the deities or make it for your family. 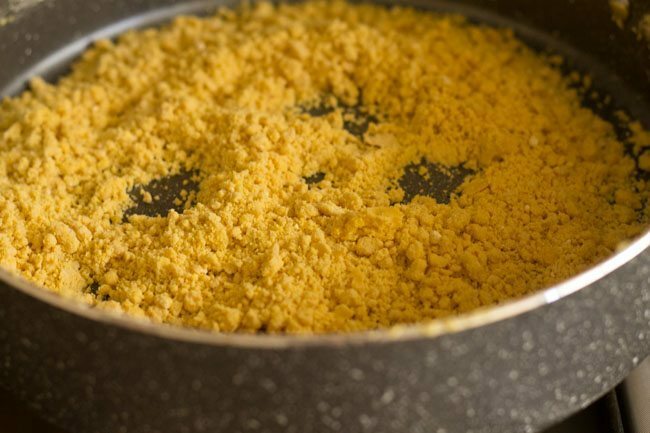 when you prepare besan ka halwa or besan ladoo, the house is full of nutty sweet aroma coming from gram flour. 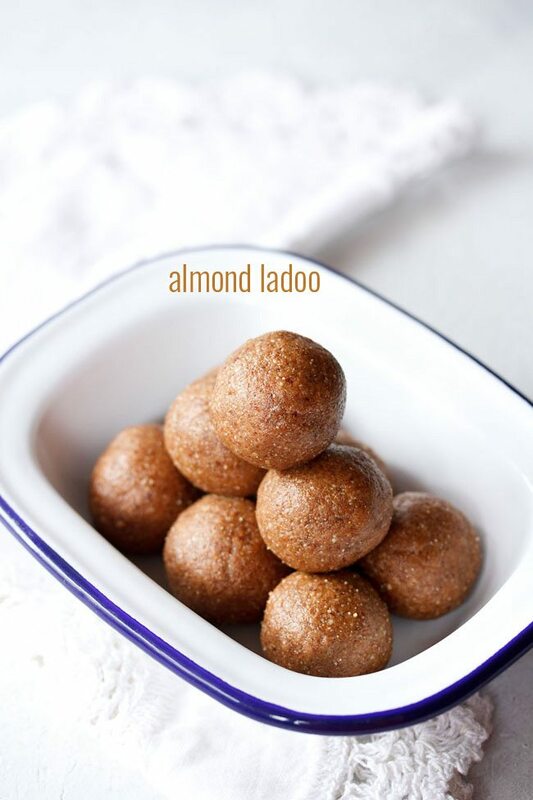 the aroma gives you hunger pangs, and you want to savor the halwa or ladoos as soon as you can. 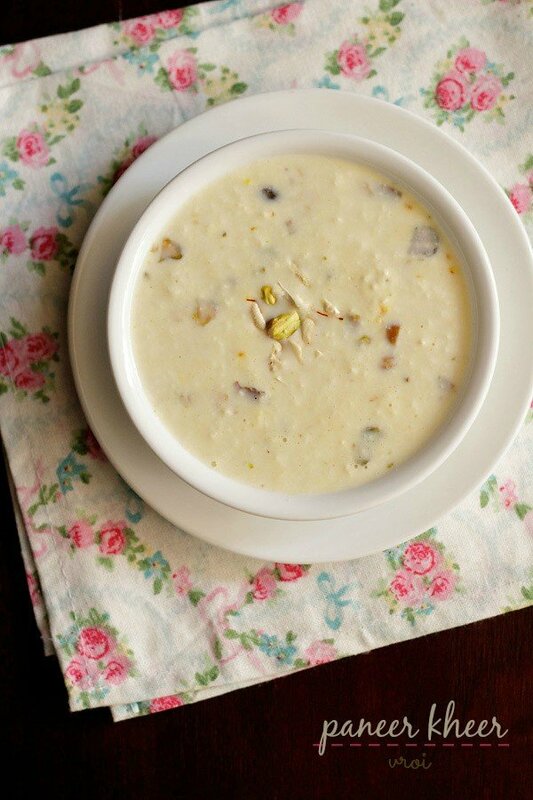 both ghee and dry fruits gives a rich flavor to this dessert. 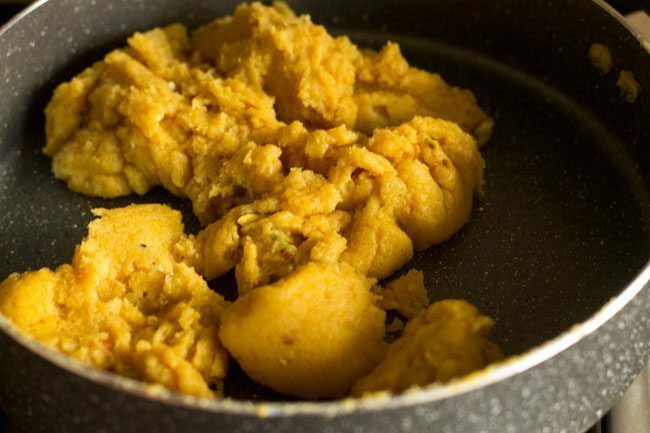 in this method of besan halwa, which is a family recipe, gram flour is roasted with ghee first and later hot milk is added. its important to roast the besan very well, otherwise it will give a raw taste in the halwa. overall besan halwa is a quick recipe but a lot of stirring is required, so too much of hand work. but every bit of effort is worth to make this dessert. 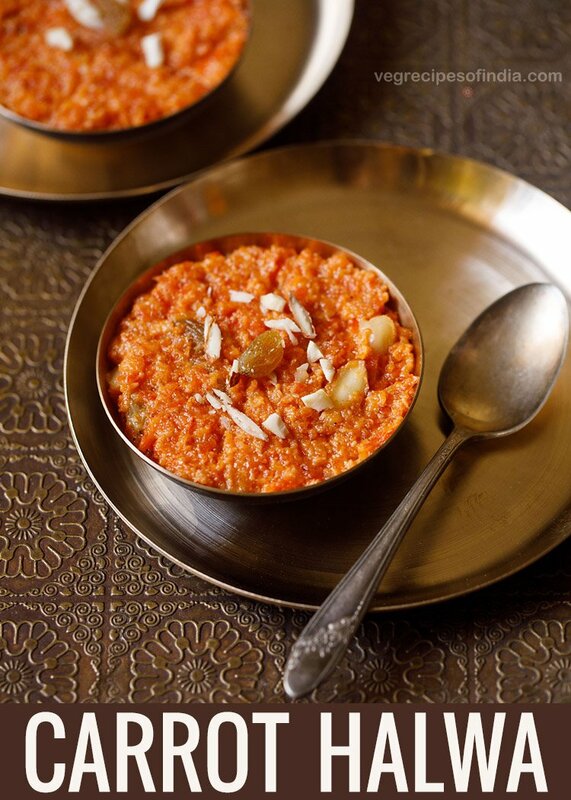 some popular indian halwa is gajar halwa, lauki halwa, moong dal halwa, sooji halwa and atte ka halwa. my personal favorite is gajar halwa and besan halwa which one is yours? 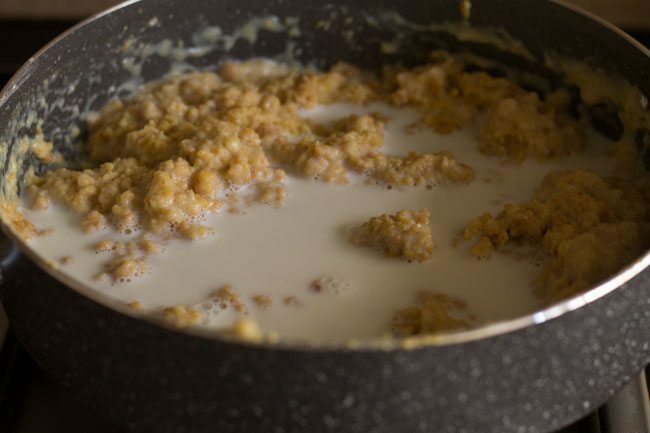 at the same time, when you keep the milk for boiling, on another stove top keep a thick bottomed pan. add ¼ cup of ghee in it. once the ghee melts, then lower the flame. 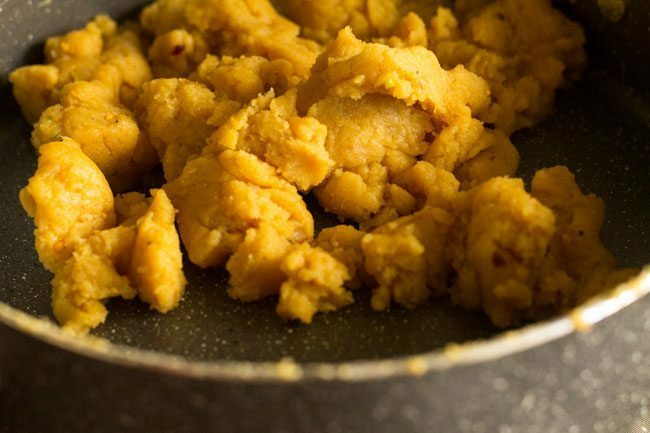 add 1 cup of gram flour (besan) and mix very well with the ghee. keep on stirring continuously so that the besan is evenly roasted. 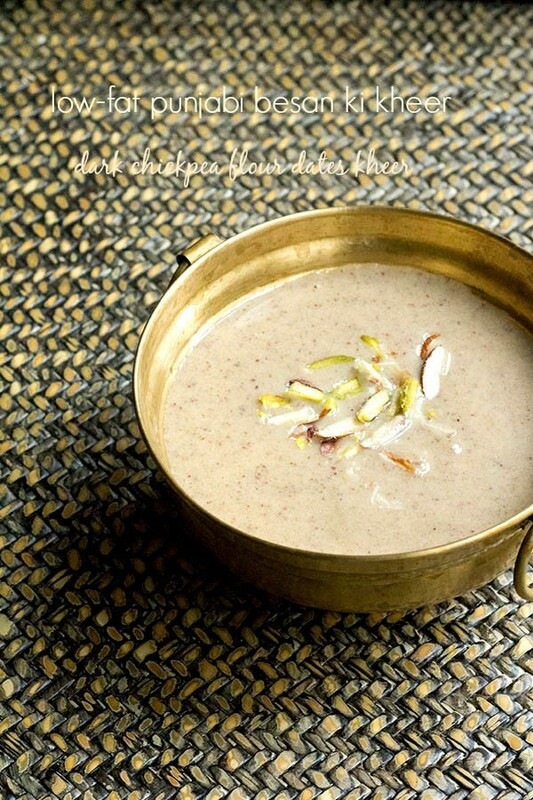 mix and stir well for 14 to 15 mins on low heat, till the besan leaves a nutty aroma. 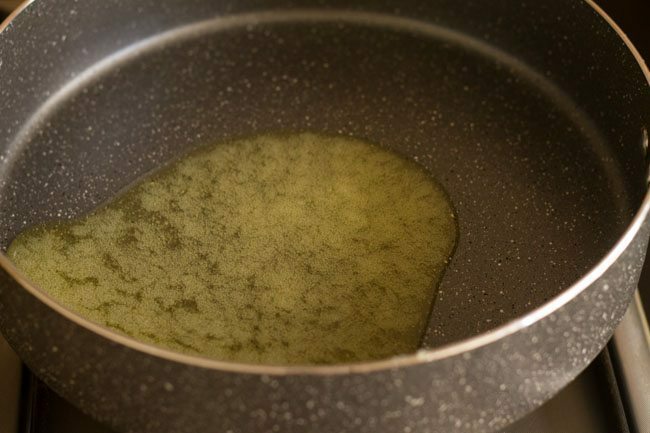 soon the gram four will start releasing ghee. by now the milk must have also got boiled. in case the milk gets boiled earlier, before the besan gets roasted, then switch off the flame and cover the milk pan. the milk has to be poured in batches. keep the flame to a low and first pour 1 cup of hot milk gradually into the roasted gram flour. while you are pouring the milk, simultaneously keep on stirring also. 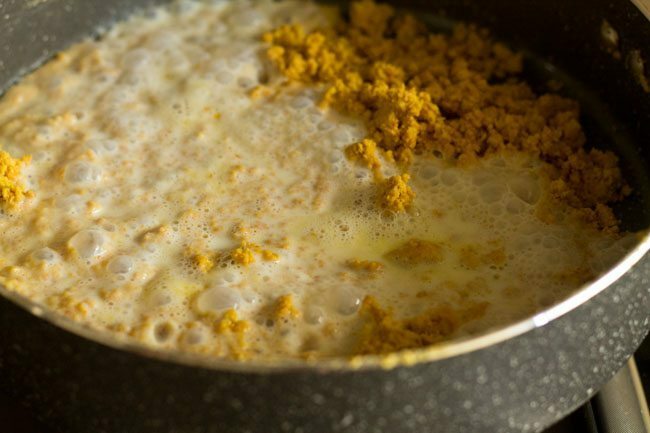 mix the milk very well with the roasted gram flour. then pour the remaining 1/2 cup milk. continue to mix and stir the mixture for 1 to 2 mins. stir well so that no lumps are formed. keep continuously stirring for 5 to 6 mins on a low flame. soon the mixture will start thickening. 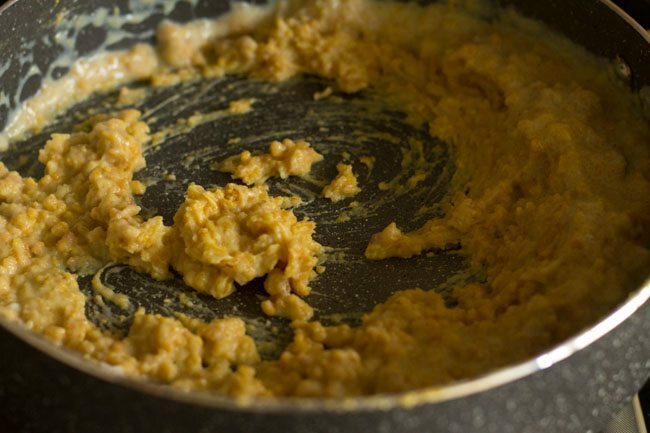 you have to continuously keep stirring the mixture, then only halwa will be smooth and without lumps. add cardamom powder, chopped pistachios and almonds. continue to stir and mix well. you will see the halwa leaving ghee at the sides. the besan halwa will also start leaving the edges of the pan. switch off the flame. the besan halwa will become thick as it cools down. 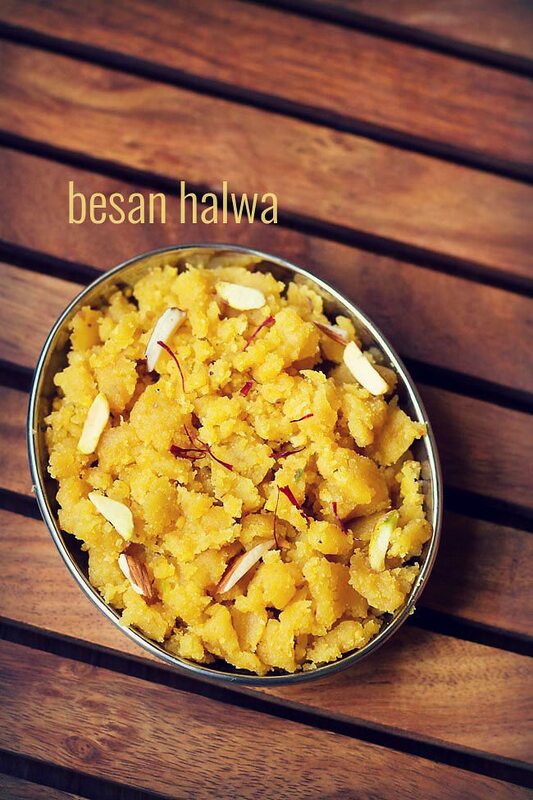 serve besan halwa hot or warm or chilled. if you want you can garnish halwa with chopped nuts and saffron strands. roast the besan on a low flame continuously. keep stirring the mixture continuously. 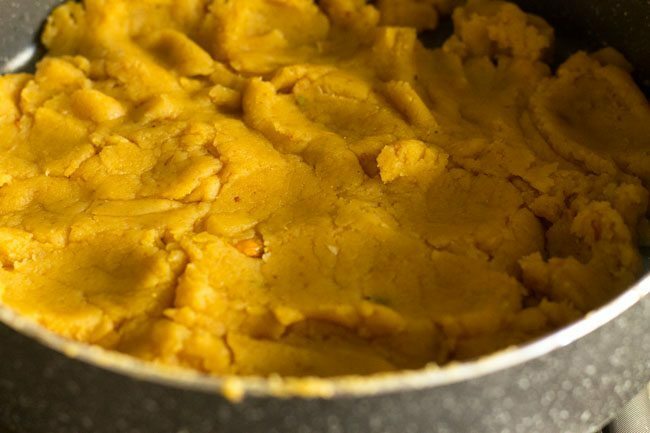 the gram flour has to be roasted evenly for a evenly cooked smooth halwa. also its important to roast the besan very well, otherwise it will give a raw taste in the halwa. you can store the besan halwa in fridge and it will last for about a week. 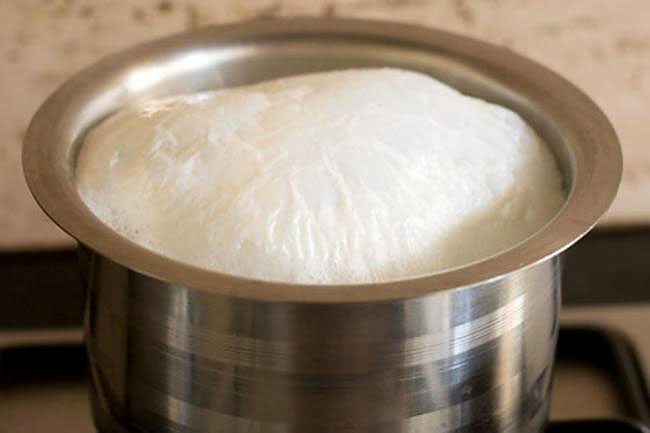 1. firstly heat 1.5 cups milk in a thick bottomed pan till it comes to a boil. 2. at the same time, when you keep the milk for boiling, on another stove top keep a thick bottomed pan. add ¼ cup of ghee in it. 3. once ghee melts, then lower the flame. 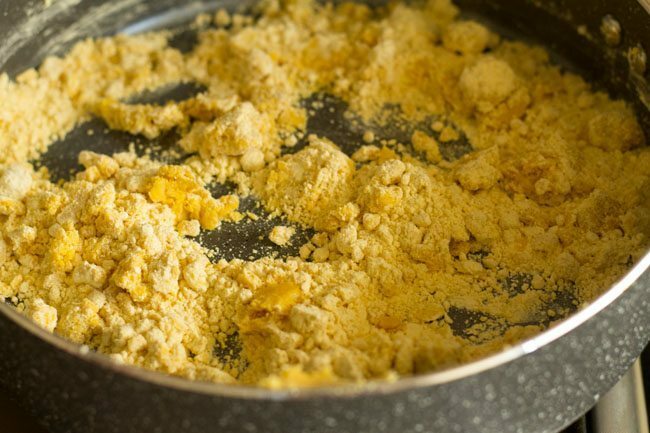 4. add 1 cup of gram flour (besan) and mix it very well with the ghee. 5. on a low flame. 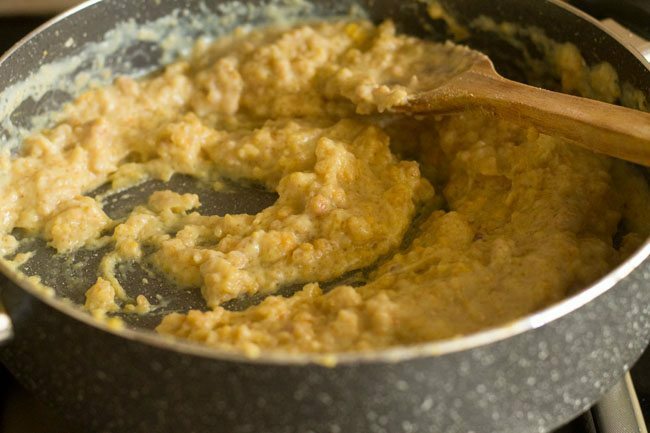 keep stirring the besan so that its evenly roasted. 6. mix and stir well for 14 to 15 mins on low heat, till the besan leaves a nutty aroma. since i have used a thick bottomed pan and the flame is on low, it has taken me to 14 to 15 minutes to roast. in a steel pan or kadai depending on the thickness of the base and the intensity of the flame, it will take less time. 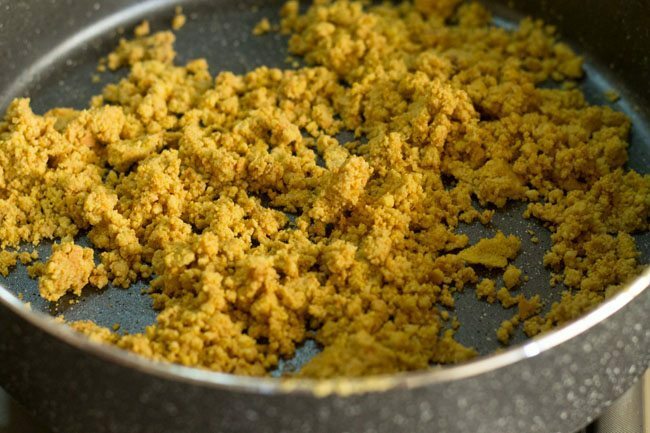 7. when the gram flour gets roasted well, it will start releasing ghee and become nicely aromatic. 8. by now the milk must have also got boiled. in case the milk gets boiled earlier, before the besan gets roasted, then switch off the flame and cover the milk pan. the milk has to be poured in batches. keep the flame to a low and first pour 1 cup of hot milk gradually into the roasted gram flour. while you are pouring the milk, simultaneously keep on stirring also. 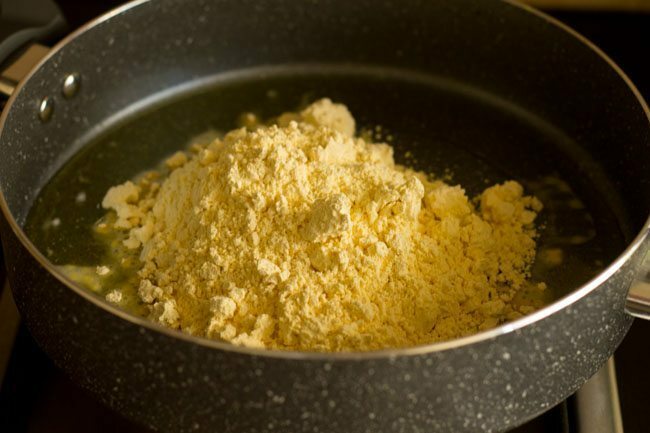 mix the milk very well with the roasted gram flour. 9. keep continuously stirring the mixture. 10. now pour the rest of the hot milk. 11. continue stirring the mixture for 1 to 2 mins. 12. add ⅓ cup of sugar. you can add more sugar if you want. 13. keep stirring continuously for 5 to 6 mins on low heat. stir well so that no lumps are formed. 14. soon the mixture will start thickening. you have to continuously keep stirring the mixture, then only halwa will be smooth and there won’t be any lumps. 15. add ¼ teaspoon cardamom powder, 4 to 5 pistachios (chopped) and 4 to 5 almonds (chopped). 17. you will see the halwa leaving ghee. the halwa will also start leaving the edges of the pan. 18. switch off the flame. the halwa will become thick as it cools down. Hi, loved the recipe. It tastes a lot like moong dal halwa bt so much easier. For how long will it be good in refrigerator? N freezer? Thanks! thanks khushbu. yes it does. it can keep well for about a week in the refrigerator. in the freezer can keep good for about a month. What to do if we have lumps even after stiring for long time and ghee doesnt ooze out?thanks! try adding some more milk and a bit of ghee. use a wired whisk for stirring as it dissolves the lumps. hope this helps. I tried some recipes and result was fabulous 😃 the pics made more easier to cook tasty food and thanks to veg recipesof India. welcome poonam. glad to know that you like the recipes and their pictorial presentation. shubha, besan only get burnt if the pan is not heavy or has a thin base. rawness is because the besan has not got roasted well. whenever roasting besan for any dish, always use a heavy kadai or pan. the roasting has to stop once the besan becomes aromatic and will release ghee. 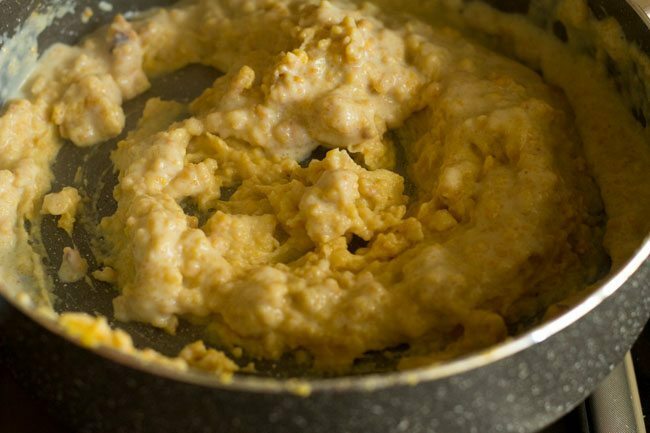 till the time ghee is not released, the besan is uncooked. it can be partially cooked but some rawness will be there. 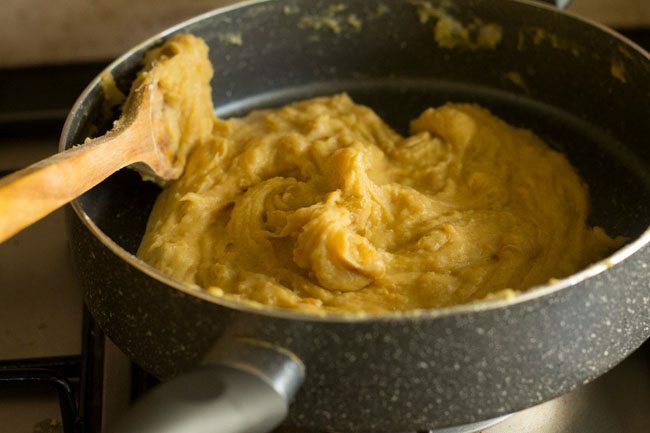 also besan has to be stirred continuously, so that it does not get burnt. i will try to add zunkha recipe. Thank you dassana,……i had used ceramic pan….next time i will buy thick kadai….I m having issues in roasting… Today I did oats upma….again went wrong in roasting…for me baking is easy wen followed ur recipes….just measuring following your steps that’s it….roasting judging seems to b difficult..than u for your advice….ya. I also got butter link….I don’t remember whether I have requested or not…pl add oats granola recipe …. Welcome Shubha. I will try to add oats granola recipe. 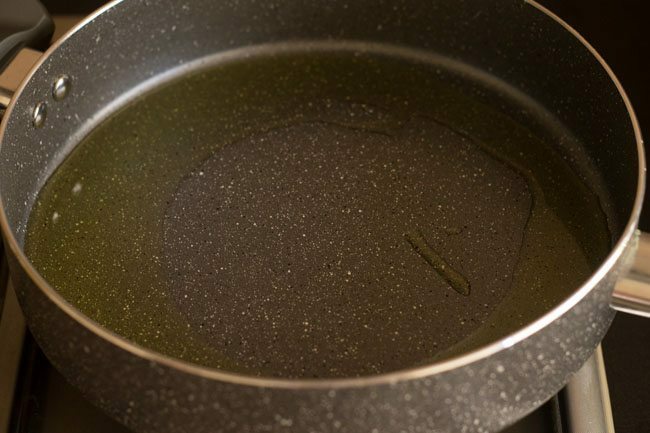 always use a thick and heavy iron pan. they are very good for roasting. you can even buy a 3 ply or 5 ply steel pans. they are heavy and good for roasting and cooking. Thank you dassana for the information… I did not knew about 3&5 ply…will get…. welcome smita. glad to know that you liked the recipes and the app. I made the halwa with water. I did everything but the color is pale yellow. However I cooked well amd taste is gud but still the color of the halwa did not appear to be as shown in the image. disha, color will depend on the quality and color of the besan. milk gives richness and also enhances the color. i feel with water the color will be pale. a pinch of turmeric or some strands of saffron would have improved the color. 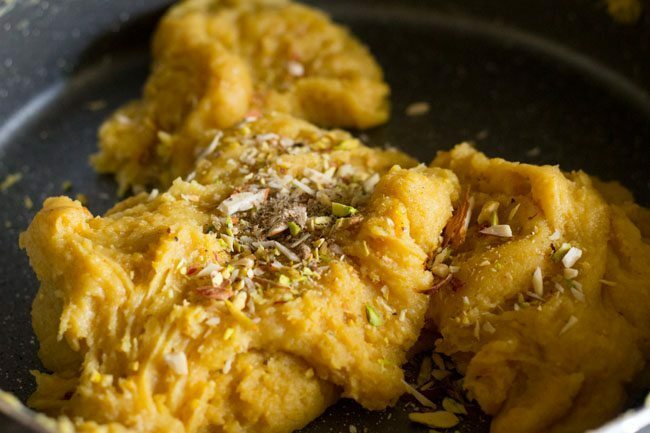 when preparing any halwa with water for color, some saffron strands soaked in a bit of warm water can be added to the halwa to get a nice color. I tried this today . Very easy and tasty! Nice one..
Dear dassana, i really love ur site and recipes. I am making lots of indian food nowadays…if possible can u pls recommend me some food and recipes that settle the stomach, both of my 2 and 4 yrs old toddlers are suffering from food poisoning ..
for food poisoning, its best to consult the pediatrician or doctor. but some herbs and spices do help. you can include turmeric (use organic ones or powder turmeric roots in a grinding mill nearby), cumin seeds, ajwain, mint leaves, coriander leaves and hing. all these spices & herbs are good for the stomach. i am not sure about the food poisoning part, but they are good for digestion. also you can include sabja seeds which is good for acidity. very pleased to know this ritu 🙂 glad you liked the kaju barfi and gulab jamuns. thanks for positive feedback and kind words. Hey my comments are finally reaching you! 🙂 God knows how many long comments I had left on your blog and they never showed 🙁 Made anjeeri matar yesterday. It was delicious 🙂 Thanks for this terrific recipe Dassana. How did you ever come up with such a terrific combination of anjeer and curd! It was a new dish to me and now it is one of my favourites. ritu, all your comments including some more readers’ comments had gone into the spam folder. i have no idea why this is happening. yesterday one reader wrote to me and then i checked the comments in the spam folder. thanks for the feedback on the anjeeri matar recipe. nice to know.